According to FBI statistics, 1.9 million burglaries occurred in the United States by the end of 2013, resulting in property loss totaling $4.5 billion. 59% of break-ins were the result of forced entry. 74% were residential burglaries that happened during the daytime. Though an alarm system or a guard dog may improve your security, locksmiths say a quality deadbolt is the best resistance to a home burglary. In most cases, Intruders use force to gain entry into a home. A deadbolt has a steel bolt that extends into the door jamb and strike plate of the door frame that makes the door harder to enter with force. If your deadbolts are used and working properly, this makes your home a less desirable target. The three basic parts of a deadbolt lock are a key accessible cylinder on the outside, the throw or bolt that slides in and out of the door jamb and the thumb turn that allows for manual control of the bolt from the inside of the home. All deadbolt locks should be made of steel, bronze or brass. Avoid die cast materials which can break apart. The most common type of deadbolt used is a basic single cylinder deadbolt that operates with a twist knob on the inside of the door and a keyhole on the outside. The bolt is “dead” because you have to manually move it in and out of place by means of a key or knob. This can still be breached if an entry door has glass panels since an intruder can break the glass and open the deadbolt from the inside. An intruder will not be able to reach in to open the door through a broken glass panel if you have a double cylinder deadbolt. This is the most secure type of deadbolt because it requires a key to operate it on both sides of the door. Some people prefer not to use the double cylinder deadbolt due to the safety concerns of exiting the home in the event of a fire. If the deadbolt is in the locking position, a key would be required to exit which may deter a quick exit or concern if the key is lost. If you do choose to use a double cylinder deadbolt system, keep a key close by but out of arm’s reach of the door area. It’s important to note that before choosing a deadbolt, know that some fire safety and building codes forbid the installation of locks that require keys to open the door from the inside. Consult with a local contractor or locksmith before installing one. Regarding the throw (bolt) part of the deadbolt system, consider the difference in security risk between a horizontal and vertical throw. The standard horizontal throw extends one inch beyond the edge of the door and into the jamb. This may not be enough to support the door and frame from a forced entrance by an intruder who can pry the door apart from the jamb or it’s strike plate to disengage the throw. This type of lock is often referred to as a rim lock/rim latch. A vertical or surface mounted deadbolt engages by interlocking with a set of cast metal rings affixed to the frame of the door. The rings surrounding the bolt make this lock virtually pry-proof making a vertical throw the safer choice of the two deadbolts. 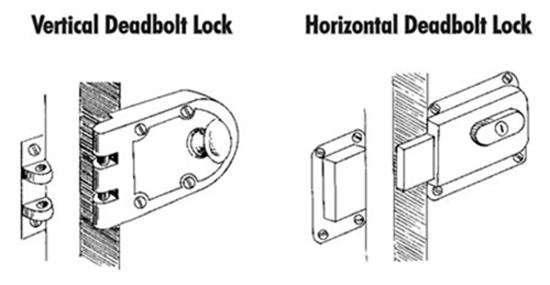 This type of deadbolt is also very often referred to as a rim lock, even though it is a deadbolt with a vertical throw. Lock bumping is a lock picking technique that can be effective in overcoming some deadbolt systems. Systems like the Schlage B760 have the Primus Controlled Access cylinder that is highly resistant to both picking and bumping even by an expert locksmith. This deadbolt is equipped with a MAG 747 High-Security Box Strike Plate and a Don-Jo reinforcer that fits around the deadbolt to stop the door from splitting. The deadbolt withstood a two-minute hammer beating, attacks with a screwdriver, hammer and pry bar, followed by a series of running kicks by a massive martial artist. Nothing happened. These tests were followed by a forklift with blades up against the door, applying gradual pressure until, at maximum speed, the spinning wheels burned through the floor tile and into the cement. The strike plate split because the door frame cracked. In-home drywall and wall studs with a reinforced door frame would likely have made the entry even harder. The only time the B660P has ever been picked or bumped was after two months of effort by the engineer who designed it. This locking system withstands all manner of hammering, wrenching, etc. A locksmith test on door security products shows how only the Schlage B660P out of all brands of deadbolts passed the barrage of battering tests. Just as important, choosing the right door type in combination with a high-security deadbolt is paramount for having the best security. A standard residential steel clad door has 24 gauge steel with a wood lock block core. The stronger steel clad doors have cores of solid wood or corrugated metal bracing or 12 gauge steel cladding which is thicker than 24 gauge. If you go with a wood door, make sure it’s solid hardwood without recessed panels which are too thin and too weak to withstand a kick in. A reinforced door frame on both the lock and the hinge will withstand a battering, ram or kick. If you’re going to install new doors that use glass make sure it’s reinforced and/or the windows are small and located away from the lock. The window should be 96 square inches at the maximum and located at least 36 inches away from the deadbolt which is longer than a tall man’s arm or use shatterproof glass with a fortified frame. If you’re more style conscious then consider adding an alarm or home security system. But be aware that many popular security upgrades may not be as effective as you think. When an intruder kicks in the door, it’s usually the door frame that breaks, not the door itself. The strike plate on the door jamb often flies through the air easily broken if not screwed in properly which is what holds a door shut. One way to prevent this from happening is to install sturdy 3 inch screws to reinforce the strike plate into the studs of the frame of the house. A home security door and frame reinforcement kit is well worth the investment to protect both the frame and the door. Surprisingly, unlocked doors and windows account for at least half of the over 7000 home burglaries and invasions every day in the U.S. alone. Then there are the doors that are locked but too weak to withstand even simple kicks. The absolute best line of defense against intruders is to consistently lock your doors using a comprehensive security system. For only $200 you can get the Schlage B660P, a reinforced strike plate housing and the Don Jo Deadbolt Wrap Around. Combined with reinforced doors and frames, your home will become a repellant to burglars. To increase your security even further, the B760 and the B860 have Schlage’s Primus cylinder which is highly resistant to lock picking and lock bumping even by the experts. The B860 adds drill and fire resistance to its list of security features as well.